I'm working on a full body for the Locost. After I gave up on Lola Mk1, I still needed a body for my 100mpg concept, and to do that much tooling for a one-off is daunting, so I'm looking for feedback on what might appeal to the full bodied Locost market. If there is one. In exchange, I'll document the full process of body design and tooling, using the 2k7 as an example. It'll be somewhat slow going. it's a fairly long process and I can't do it full time at present, but so it goes. 2) Retrofittable to an existant Locost. #2 is...well, all I have to do is do it, though it was tempting to make a body that only fits the quirks of my chassis. But a retrofittable kit seems smarter; heck, I might even be able to sell some parts and/or plans. #3 is interesting, as the two goals contradict each other, but I think I can make some smallish differences that'll produce biggish differences in behavior. The "Slick Brick" will come first, followed by the Stick Brick. #4b is really really tough, but basically, that's what a Locost is (or a Caterham or a Dax or an Ultralight etc); a blend of old and new. But it's hard not to look just plain stupid when you do blends over the decades, so I've been pulling hairs over #4. #5 took care of itself when the other requirements were met, and #6 as well. The basic plan is, new front and rear fenders, with 9" wide by 13" high aluminum sheet pontoons joining them (or wider/taller for those with non-book frames). A single curve sheet of aluminum joining the rear fenders together, curved on the horizontal axis (fuel tank relocated to the offside pontoon and the upper rear 3/4" hoop removed from the chassis so the stern can drop down). Front fenders tapering back all the way to the middle of the car (junctions of the J tubes and N tubes in the upper frame rails), a la lots of classic racers of The Day and 3/4 of the LMP1 cars this century. A flat sheet of aluminum between the inside of the rear-of-wheel section of each front fender and the J tube (and the bonnet, which rests on the J tubes). And finally, single curved sheets of aluminum between the forward-of-wheel portion of the front fenders and the nose. The four fenders, flanges to fit the sheetmetal to the sides of the nose, and internal ductwork will be made from composite; fiberglass for the most part but I'll include some carbon fiber fabrication techniques if desired. I'll show how we formed the bulkheads for the pontoons and how to form a smooth 3/4 radius bend in sheet steel and/or aluminum, and that'll about do it for the Slick Brick. I'm hoping it will look like a race car that could have been built circa 1960, but wasn't, and I'm hoping (expecting, actually) the drag reduction will significantly improve top speed and fuel economy. The Sticky Brick (the downforce package) is going to be more complex, with diffusors front and rear, reshaped body forward of the front axles, and a wing in back. Appearence-wise it'll be LMP but with a taste of Seven (front engine, radiator intake, and relative simplicity). But that's another story--the first goal is a practical 100mpg freeway cruiser and backroad hooligan. These drawings were done on a demo version of Rhino, so I only had 25 saves to work with. Ignore the nose for now; the standard nose already exisits so it wasn't (and still isn't, even though I loved the demo so much I sprung for the full Rhino) worth wasting saves by modelling it...the nose is part of the Stick Brick sub-program. But first things first. Last edited by JackMcCornack on March 15, 2007, 1:40 pm, edited 1 time in total. One thing I see that's missing is headlights. How to plan to handle them, as the stock style headlights on a 7 are anything but aerodynamic? I do like the look of it though, would make a very fun around town / Sunday drive cruiser. It looks to me like there is room in the front fenders. You could probably put them where I have the black circles on Jack's pic below. The front fenders stay high well forward of the wheel--not ideal aero but enough room to hide a conventional headlight under a plastic shield. That's one reason thefront fenders are simple curves on top--a flat sheet of Lexan will bend to fit it. Ideally I'd put in the little round Hellas, but they're nearly a hundred bucks each and it'll call for four of them. Also I've been scouring junkyards for individual projector headlights (or paired projectors I can saw in half); there's room for one on top of the other. And for the ultimate in recycling, one could put HF fog lights recessed into the upper front of the fender, and keep your headlights in the trunk during the daylight, and plug them into sockets on the body when one must travel at night (or must pass an inspection). My local DMV says they'll have no problem with that; headlights that disappear in the daylight are commonplace (eg older Miatas) and there's no rule saying a motor has to retract them, or that they be raised or lowered from the driver's seat. I don't know about every state, but here if you had plug-in headlights you could run a completely clean front end except for the turn signals (but I'd do fog lights so there's be something to turn on in the daylight). FWIW, in Canada the headlights must be centered at 22" or higher above the ground for vehicles less than 80" wide. I suspect this is a duplicate of the US reg so it may be worth styling the fender such that the headlight ends up there. Also, my copy of the consolidated federal (CDN) vehicle regs are pretty dated (1987) but I doubt that spec has changed since it seems logical enough. Verify but the number is likely good enough to get the ball rolling. One off cars are likely exceptions but if you plan to "mass market" these body parts as kits then it is probably a good idea to play nice with the federal regs. Once upon a time in a galaxy far, far away I took aerodynamics at the university level. Looking at your image I think there are anumber of things that could be done to clean up the shape if you want to take a serious run at 100 mpg. The shape needs to be smoother... The dips and valleys both transversely and longitudinally need to go. But then it stops looking like a Locost... I know. What about adapting a shape similar to the new Lotus 2-Eleven to a book/McSorley chassis? It would be a pain to ship but with a little bit of clever design and cutting required by the buyer you might be able to envelope all the chassis types and let the buyer make the cockpit hole where they need it. Maybe a two peice arrangement with a tail that is bonded into location by the buyer makes sense. Not rigid for shipping but... Maybe make the fenders a separate mouling/peice still and have it bolt together with a rubber welt (kinda like 911 fenders) between them - or similar. Again, JAT (just a thought). Thanks for the comments. It is tempting to go slicker, but it would be quite time- and money-consuming. You're right about the dips and valleys, but at least they go pretty much in the direction of airflow...still there's way more surface area than needed in the big dips between the front fenders and nose, and it will increase drag. --I want the Sticky Brick variation to be retrofittable without major changes, using the same pontoons and with minimal mods to the fenders. I like your ideas re shipping. Perhaps the shipping barrier isn't as great as I imagine for a minimal-drag smooth body. And once The Foam Arranger is up and running, it'll be possible to make such a body without spending manmonths on the project (or without ripping off somebody who did ). But right now, keeping it locost in style and spirit means a lot to me...perhaps so much that I'm letting emotion override logic. 'Cause what you're saying jives with everything I've been taught. So I'll think about that; if I'm going to change horses it's better to do it on the shallow side of the stream and I haven't cut any materials yet. PS thanks for the 22" figure re headlights, I've been going by the Oregon Vehicle Code...one of the reasons I want to use projector headlights is the smaller diameter helps when it comes to center-of-beam height. And if worst comes to worst, I can get my inspection with the suspension adjusted to the top stops. Examine every idea even if you don't like it in principle as it may lead to another idea that you do like or an idea that can augment the original purpose. Ideally you want a design that others want to put on their machine. Just some ideas off the cuff. Of those above, the styling one is the toughest nut to crack as it is what will draw the largest numbers of people to want it. Mix in a little extreme form follows function and it will be easy to design/produce/sell and look good at the same time. Simple shapes are the best shapes for long term appeal. Do you want some specific cars to look at for ideas? There's lots in the 50s-60s as you said. He! !, your original idea for the Lola is a winner in my opinion. If you aren't lofting from an original Lola but making a car that is "inspired" by the Lola I don't think any lawyer could find fault with that. A Lola with modern fender/rear/cockpit treatment might be a shape/design worth pursuing. Sort of a different camp reponse to the 2-Eleven. Btw, another idea regarding the side "pontoons". Make the bottom half not part of the mold. That is, the owner is to add material in steel in this area of the chassis to build semi-monocoque pontoons that run between the wheels. Your body work runs over this structure and it allows some flexibility in how to deal with "non-standard" width chassis. As an example, in order to fit to a book chassis the home builder must make the pontoons X inches wide, a 442 owner must make them X-2" wide to compensate for the chassis width. You can make a section of the body work removeable perhaps (optional to the builder/racer) so that a door swings up similar to an old McLaren Can-AM style car or swings open perhaps like an E-type to expose a nice shiny (?) aluminum box under the bodywork. It would make the chassis very rigid as a benfit and in theory add some more side protection in case of accident. The weight addition would need to be calculated of course but if the external portion is replacing the need for fiberglass and related support structure then some of the weight is offset in a positve way. It also makes the molds simpler/smaller since you don't have to cover that part of the car. It also gives a potential logical break point in the mold for packaging/shipping. Yes adds much complication - just a thought to iterate with. Golly, great minds think alike. But seriously, Darth V8r, that's another reason for me to stick with my original plan and not get sidetracked optimizing a one piece molded body. You've described the pontoons in the drawing, there's no "mold" at all, just bulkheads inside and fenders at each end. Of course, if one wants all that covered with a swoopy compound curved body, then it gets complex, and starts needing doors, and gets heavy too--at least compared with the current plan which is to use the pontoons as both structure and body, and let folks step that extra 10" to the cockpit. As Werner von Braun said, Better is the enemy of good. This body will make for a slower car than would a body optimized for slipperyness, but this body has different parameters--light, cheap, simple to make, and sevenesque. I think as far as drag reduction goes, the 2k7 will be a big jump ahead of the standard Locost body, and the next big jump will be taken by someone reaching for a different star. This body will not appeal to perfectionists, it may not even appeal to those seeking excellence...but hopefully it'll appeal to people looking for a significant improvement on a Locost budget. Here's the body sans fiberglass parts and hood. The sheet over the front of the cockpit hasn't been trimmed for the engine since it was hidden by other parts, but this is the basic idea. Pontoon box sections from floorboard to tube M2 (page 51 of The Book). As Werner von Braun said, Better is the enemy of good. Didn't know that one. Cool. This body will make for a slower car than would a body optimized for slipperyness, but this body has different parameters--light, cheap, simple to make, and sevenesque. I think as far as drag reduction goes, the 2k7 will be a big jump ahead of the standard Locost body, and the next big jump will be taken by someone reaching for a different star. This body will not appeal to perfectionists, it may not even appeal to those seeking excellence...but hopefully it'll appeal to people looking for a significant improvement on a Locost budget. For the record I'm about as anti "space shuttle programme" as anyone can be. CAD drawings and calculations don't get shredded rubber on the asphalt. My only further comment would be that if you are making this body with the intention of it being a one off for the goal of 100 mpg then you have a lot of freedom. Will you get to 100mpg with the Kubota? I dunno, but I'm not optimistic with the "swoops" in the body as it is... Actually, what is your target speed for the 100mpg run? The lower the less critical aero becomes of course. You're right as usual. I'm optomistic re the 100mpg only because I haven't named a speed yet. The highway mileage figures you see on new car window stickers are taken at 45mph if I recall correctly. But the 100mpg car isn't my main motive here, it's merely the last straw that got me off my duff and put this body on a front burner. The "swoops" will come in handy when it's time for the Sticky Brick, plus keeping it cheap is a big factor for me. Hey, the chassis only comes so high and the wheels go so high, anything bridging that gap will cost money, so what's a fella to do? And the swoops are only the tip of the iceberg, there are plenty of other non-optimizations built in. For example, the fenders have wheel openings on both sides. It wouldn't need the inside openings with a high body 'twixt fenders and nose, but this keeps it cheap and besides, I've always enjoyed watching my front wheels move up and down. Marketability? This is being built without a market survey, we'll just have to see what happens. It's sure not going to have broad appeal, but broad appeal is a problem for Ford, not for Kinetic; all we need for success is a handful of folks that will buy fenders and download plans for the sheetmetal bits. Sad to see you gave up on the Lola Mk1 body. One other thing you might want to consider. DM/EM class legality. Latest rules allow for reshaping the body up front but car must be "reconizable" as a 7 (or other production car). For example this car is generally agreed to be legal except the front spoiler sticks out beyond the body (nose) outline. See below..
Also, you might want to look at the Slippery Brick. 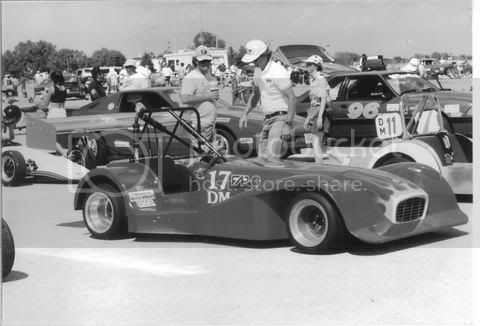 A modified 7 racer (from the 80's?). Unforunately I don't have any good pictures of it. Hi Grinch, yeah, the Lola is so darn pretty...but if I want to get disgruntled when other folks rip my stuff, I should avoid joining the ripper crowd, even with a vintage long-out-of-production racer. As Darth v8r pointed out, there'd be no legal hassles likely, but if it's perceived as a copy of a Lola Mk1 it might change my image a bit. However, someday an...homage, yeah, that's the ticket...an homage to the racers of the era might be in order. But first things first and such a body would violate my Cheap parameter. I guess I'd better get the latest rules. Are they available on line or do I need to buy another book? And yes, I'm familliar with the Slippery Brick, and indeed inspired by it...the similar nickname is more than coincidental...but like the photo in your message, it had groundskimmer pontoons, adding nothing to stiffness or crash protection (not that the 2k7 pontoons will add much crash protection, but still, every little bit helps).